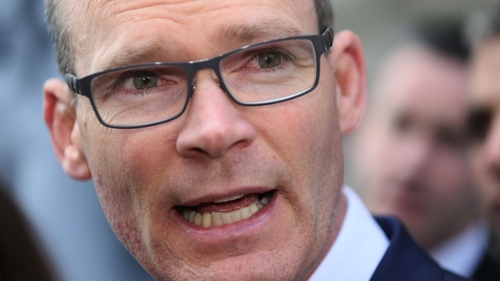 Minister for Housing Simon Coveney has said that it is all still to play for in the Fine Gael leadership campaign and he is optimistic that he can still win. Voting has been under way since Tuesday and the result will be announced tomorrow. Speaking on RTÉ's Today with Seán O'Rourke, Mr Coveney said the campaign had got off to a frustrating start, with members declaring for Minister for Social Protection Leo Varadkar before hearing what both candidates had to say about what they wanted to bring to the party and the country. However, since the hustings debates, he said, he believed that people's opinions had changed. When asked about comments by Mr Varadkar that he cannot comment on Mr Coveney's policies because he has not seen any, Mr Coveney said "that's just Leo being smart-assed". He said he had proposed six or seven big ideas to bring to the Taoiseach's office to change the country, but he has not published an election manifesto - which, he said, Mr Varadkar has done. Mr Coveney said he had not promised any jobs to people, should he become the next taoiseach, nor has anyone on his behalf. He added that he was happy to remain as Minister for Housing if his leadership bid was unsuccessful. Fianna Fáil, he said, "thrashed the economy" and over the past six years, Fine Gael has worked to rectify that. Mr Coveney said he believed that Fianna Fáil would test the next Fine Gael leader "hard" over the next few months, but said both he and Mr Varadkar are well able for that challenge. He said he was a nationalist who believed in a united Ireland but he believed in uniting communities before looking at border polls. If the peace process is to move to the next stage, Mr Coveney said, we have to realise that the past is the past. However, he added that he did not believe Sinn Féin and Fine Gael are compatible and a coalition of those parties would not happen if he was the Fine Gael leader. Mr Coveney said that political contests are competitive and friendships can become strained but he urged people to vote based on what they believe is best for the country and party. He said he believed politics needs to move in a new direction, and he was the best person to do that. Almost 21,000 members are eligible to take part in the vote, while TDs and senators will have the biggest say, with 65% of the total vote. Councillors will have 10% while members will have a 25% say. The Labour Party has called on the next taoiseach to ensure children are given rights that would guarantee them access to emergency accommodation. The party today published a bill that would require local authorities to find accommodation for children facing the prospect of sleeping on the streets. "I think we were all shocked to hear reports about homeless families and children having to sleep in a Dublin Park because there was no other accommodation available," the party's spokesperson on housing, Jan O'Sullivan said. She said the Labour proposal would make the best interests of children the focus for local authorities from now on.